Thursday, 12/31.... Our friend Brad came in town from Arizona and we had our NYE bash at the compound which ended up being a big hit. I think at points during the party there were easily 60 people here. It's interesting we were able to pull that off considering we don't know 60 people in Austin but I guess the word got around. We were most excited by the fact that we were finally able to pull off our long time idea of projecting abstract movies on the house and using it as a party prop. It was all the bit as fabulous as we had thought it would be! Now we've decided we're going to have movie night at the compound. We figure we'll invest in a projector, get our fire pits going, invite some good company over, kick back and watch a movie. How fun will that be!?!?!? Kind of like the old drive-in days. Maybe Clay will sneak his arm around me and try to bust a move...ha,ha,ha! I even cracked myself up on that one. Then Friday came and we had big plans to take Brad to all our favorite places around town. In addition to Brad, Clay's cousin, RJ, was in town from Minnesota (I'm fairly certain he was happy to land in Austin where the temperature was 45 degrees vs the -20 degrees weather that he left in Minnesota) . We had big evening plans to take everyone to this great new hip restaurant on the East Side and go see a band afterwards. Unfortunately, this was only a great idea in theory as EVERYTHING was closed on Friday. I MEAN!!! That is a little ridiculous! Granted it was New Year's Eve but Austin is vaguely a tourist town so you would think at least restaurants would be open. Nope! Nothing was open. So, poor Brad didn't see much on Friday especially considering Clay didn't get out of bed until 2:00 pm. due to his hangover...horrible host. Anyway, that evening we were able to find one lonely open restaurant. We had to wait two hours to be seated but the food and company was great so it was worth the wait in the end. The next big thing was the Tech football game. I'm not sure if yall heard about the debacle but our piece of crud school (excuse the language but I'm VERY upset) fired our football coach Mike Leach. Clay hooted and hollered over this and not in a good way! I mean he threw a FIT! He called the Athletic Director. He called the Chancellor. He said he would "Never support the school again" and he meant it. He said he was going to take our Alamo Bowl tickets and mail them back to the school and tell them "bleepity, bleep, bleep" (I'm leaving out the vulgarity since this is a family blog). Anyway, after a couple days, I was able to convince Clay we needed to go to the game. Not only did I not want to waste $180 we paid for the tickets but we also made plans with friends. We told them we were going to be there so we needed to be there. So, we went to the game and had a blast! 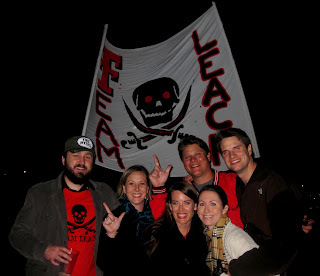 We bought "Team Leach" t-shirts and "Fire Myers" stickers and supported the team. At one point the entire stadium was chanting "We want Leach" and at another point they chanted "Fire Myers". It was great that we were all able to get that out of our system and good to know others felt the same way. Also, at two points during the game, the entire stadium was able to give big "BOOOOO" to the little sucker that got Leach fired....Ugh!!! I have to say it was exhilarating! In honor of Leach, he gets a "Team Leach" blog on Hola Lola. We'll miss you Leach!! !Anyway, I'm off my soap box now....time to move on I guess. So, after this big fun weekend, I packed up and was off to Florida Monday morning at 5:40 a.m. Just in case you're wondering, this calculates into waking up at 3:45 a.m.....OUCH!!! Now I'm back and have SOOOOOOOOOOOOOOOO much to tell you about Lo (you won't believe some of the things coming out of her mouth) but I'm going to keep the blog brief today. Well, brief in my terms which really isn't considered brief I guess. With that, I PROMISE I'll be back tomorrow to share some fun stuff going on in the Odom household!! !